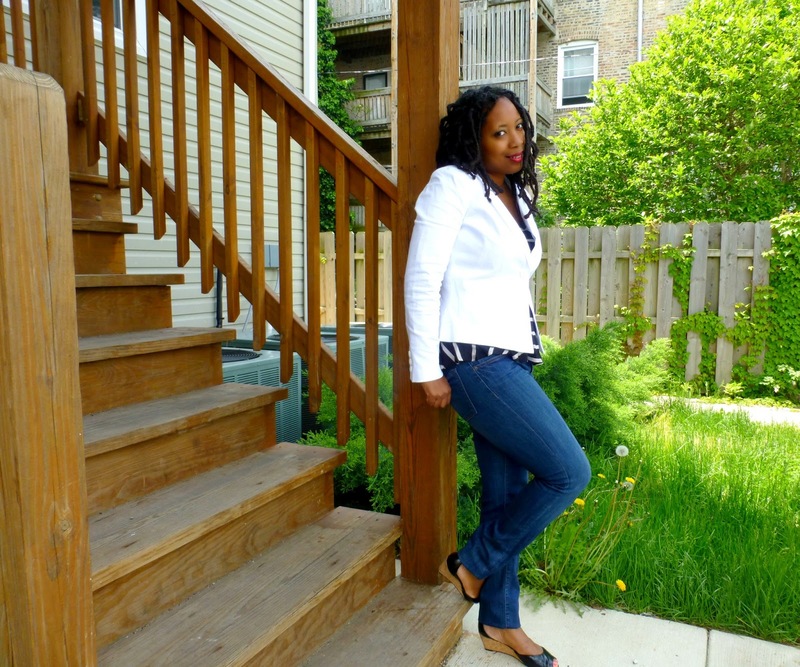 As part of a sponsored post for Collective Bias, I had the opportunity to check out affordable fashion at Sears and express my Sears style. I went in search of the perfect outfit for an alfresco dining experience. I can’t wait until the weather starts cooperating because a lot of my summertime activities involve outdoor eating at restaurants, festivals, and cookouts. Surely, I’m not alone? 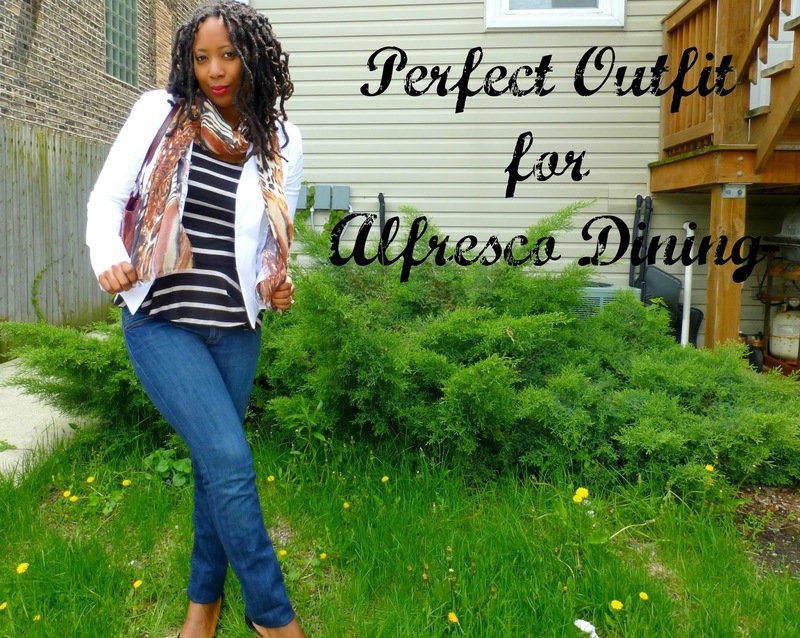 One day I’ll take my love of alfresco dining global! Paris will be my first stop as I have always wanted to visit and I have a love of stinky cheese, decadent desserts and wine. I see myself sitting outside in a huge open air cafe holding a glass of cabernet and noshing on cheese curd covered french fries while watching chic folks stroll by. While shopping at Sears, I chose a mix of classic and trendy pieces that represent my love of alfresco dining and my love of Paris. With alfresco dining, you are likely to experience a range of temps going from day to night so you need layers and nothing says parisian chic like a striped tee, blazer and scarf. I picked a very soft black and white striped peplum tee. Peplums are my friend and I’m glad they made it back to the trend limelight. Black and white stripes are also on trend. It’s an “in” pattern right now and it’s definitely a wardrobe keeper going past the trend. I also found a fabulous blazer in the petite section. 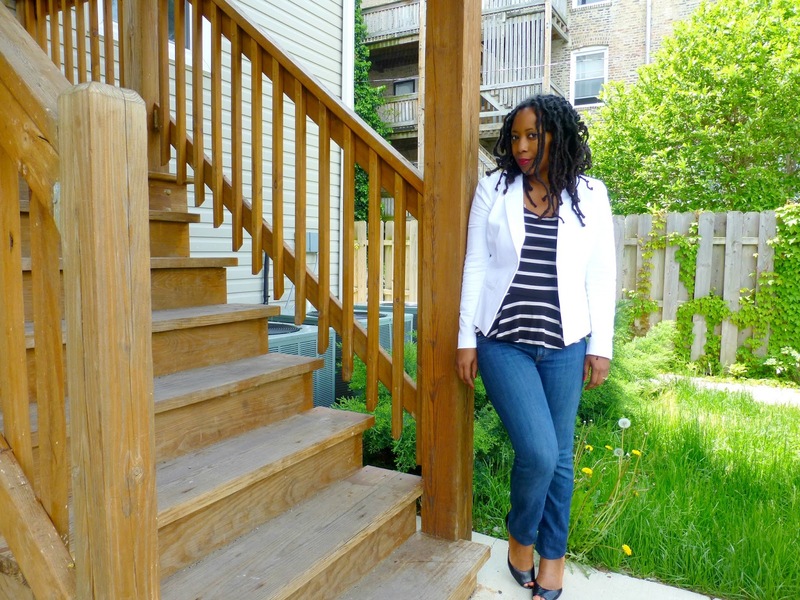 A white blazer is a closet staple for me. I already own one but the sleeves are too long. This one has a great fit. That’s a rare occurrence for me. I also love the sleek tuxedo shape of this one. It’s interesting yet understated and can stand the test of time. 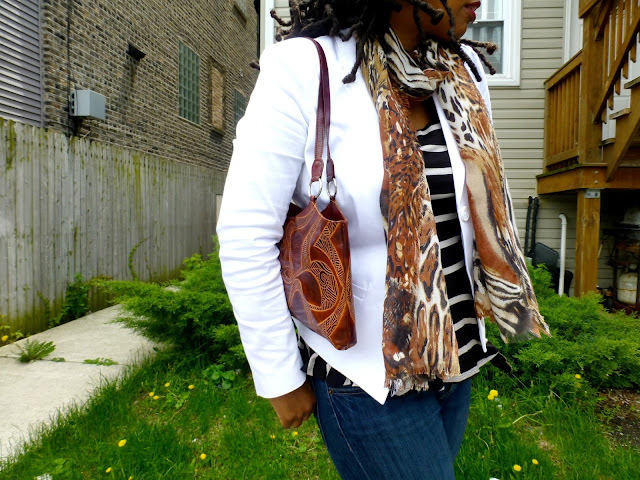 My last purchase was a great lightweight animal print scarf that is a mix of browns and blacks. It matches everything and provides an extra layer should the temps turn cooler as they tend to do in Chicago. I married my purchases with a purse, bracelets, skinny jeans and low wedges already in my closet. My Sears purchases totaled $50! Everything was on sale and the blazer alone retails for $60. I also received 2,770 Shop Your Way points which can be used towards my next purchase. Should my Paris vacation arrive later rather than sooner, I still have plenty of alfresco dining to do here plus some extra dollars saved by shopping at Sears. Connect on Facebook or Twitter to learn more about the affordable fashion and Shop Your Way rewards available at Sears. To see more of my shopping experience, visit my Google+ album. I love this outfit! 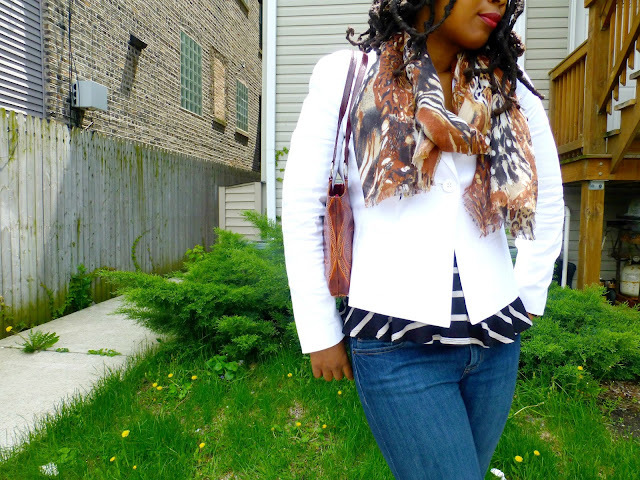 The white blazer is a must have for the summer and cute peplum top. You found great pieces at Sears! I really love this look! 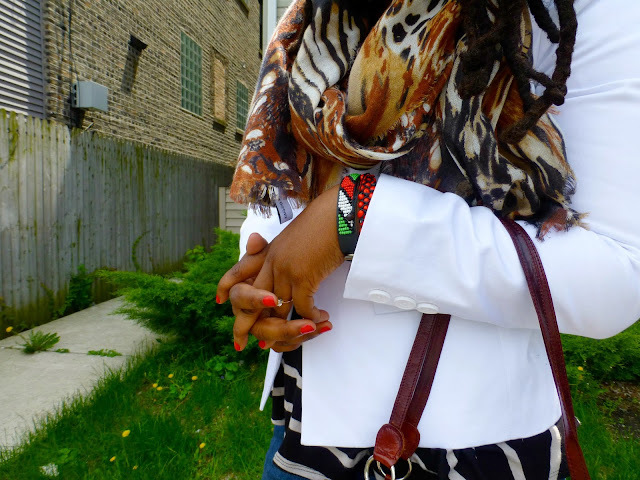 You can't go wrong with a white blazer. It's hard to find a good one though. That's still on my list of must haves. Way to go girlie! What a fun post and great items you found at Sear's. 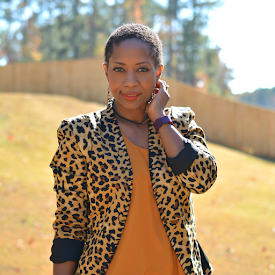 The blazer is so chic and will accent many of your items in your wardrobe. Oh, what about that cool maxi dress/skirt from last week?? I love it! The whole outfit! I also want/need to hit Paris and eat lots of cheeses and mostly..let's be honest- wine and champagne!! Love it! That white jacket with the stripe shirt is all that. Dude, I need to check out my local Sears. I hardly ever go in there to shop for clothes, however I love your peplum shirt. Love the entire look...especially those wedges! Very cute! I love this look!